Turkmenistan has been ruled as a dictatorship since 1991 when the country gained independence from the Soviet Union. Saparmurat Niyazov became Turkmenistan’s first president, ruling the country from 1991 until his death in 2006. He was succeeded by the relatively unknown Berdymukhammedov, deputy prime-minister and Minister of Health under Niyazov. He, like his predecessor Niyazov, has created a personality cult around himself, calling himself “Arkadag” (“Protector’’). Berdymukhammedov controls almost all aspects of public life in Turkmenistan, does not allow free media and supresses civil society. Furthermore, elections in the country have not been regarded as free or fair since 1991. The Democratic Party of Turkmenistan (DPT) currently holds all 125 seats in parliament, which it gained in the 2012 parliamentary elections. Other parties and organizations were allowed to run in these parliamentary elections, but all pledged allegiance to the president. In February 2017 Berdymukhammedov, was elected president for the third time, winning more than 97 percent of the vote according to official results and beating eight other candidates. Want to get notified by mail when Turkmenistan gets updated? Berdimuhamedov was born in 1957 in a village in the Ahal-Teke-dominated central region of what then was the Soviet republic of Turkmenistan. He studied dentistry at the state medical institute and later worked as a dentist and an academic. 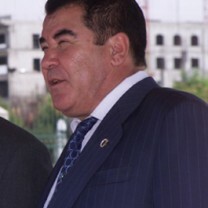 Berdimuhamedov was the longest sitting minister under Niyazov, before he became president after Niyazov died in December 2006. At his first inauguration he promised to continue the policies of his predecessor but also to introduce reforms. Berdimuhamedov countered some of his predecessor’s bizarre decisions, for instance by restoring the calendar. He also allowed the internet into the country - although one can only make use of it under strong surveillance. This led to a brief period of hope for some sort of ‘thaw’, which however failed to materialize. Allevation of internal travel restrictions were soon evaporated and the strange form of Turkmen nationalism centered around the president, which was started under Niyazov, was continued by his successor. Most reforms seem to be cosmetic, and/or in order to please the West, with whom Berdimuhamedov hopes to do business. Nevertheless, the alleviation of some of Niyazov's more obscure measures were generally welcomed by the Turkmen population. During a ceremony in 2010, Berdimuhamedov was given the title “Arkadag,” or “Protector” or “Patron”. The Central Asian country of Turkmenistan is known as one of the most repressive countries in the world, containing strong elements of personal leadership, despotism, and constitutional subversion. After the disintegration of the Soviet Union in 1991, before-Soviet-leader of Turkmenistan Saparmurat Niyazov remained in office as the president of the newly independent Turkmenistan. In 1999, he was proclaimed president for life. Now that the Soviet socialist ideology had been discredited with the disintegration of the USSR, Niyazov looked for a new way to legitimize his undemocratic hold on power. To this end, he created a nationalist ideology in which he figured himself as the person needed to lead the country to prosperity after independence. He called himself Serdar Turkmenbashi, Leader of all Turkmen. However, on 21 December 2006 Niyazov suddenly died of a heart attack. After his death Gurbanguly Berdimuhamedov assumed the presidency and 'won' the two (unfree and unfair) elections afterwards. Disregard for civil liberties, including freedoms of speech, press, assembly, religion and movement under the authoritarian President Gurbanguly Berdimuhamedov, dominates Turkmenistan's human-rights record. The country is affected by corruption, drug trafficking and clan politics. Turkmenistan is governed by a single party under the lead of an authoritarian president who is head of state, head of government and commander in chief of the armed forces. According to the constitution, the president is elected for a five-year term. There is no vice-president or prime minister. The parliament – the Mejlis – is controlled by the president. The legal system is based on civil law with a constitution as the fulcrum of legal authority. At the judicial level, there is a supreme court consisting of judges appointed by the president. The 2008 constitution introduced the legal possibility to form multiple political parties. Before this, only the Democratic Party of Turkmenistan (DPT), which is a continuation of the former Communist Party of the SSR of Turkmenistan, was legal. Currently, there is one other party, the Party of Industrialists and Entrepreneurs (PIE). The new constitution also drew an official line between the representative and executive bodies. Article 82 of the constitution was amended to describe that the provincial, city, district and town governors would be appointed directly by the president of Turkmenistan acting merely as representatives. As commonly practised before, local leaders can now also legally be removed if they act against the liking of the president. The presidential election system requires that a candidate can only win by obtaining more than 50 percent of the votes, either in a first or second round. If only two candidates contested the first round and none fulfilled the above mentioned legal requirement, a repeat election is to be conducted within two months. However, the failed candidates cannot contest the repeat election. The presidential election is administered by a four level election administration comprising the Central Election Commission (CEC), six Regional Election Commissions (RECs) including the election commission for the city of Ashgabat, 65 District Election Commissions (DECs) and some 1,600 Polling Station Election Commissions (PECs). The CEC members which took office in July 2010 have been approved by Berdimuhamedov. The RECs are appointed by the CEC, the DECs by the respective REC upon nomination of the people’s councils of the towns and communes, and the PECs by the respective DECs upon nominations of the corresponding people’s councils. There are no legal restrictions on the participation of women or minorities in the political process. Nevertheless, they are underrepresented in government and politics. Currently there are 8 women and 42 men in the Mejlis. Furthermore, there are 2 female ministers in the government, contrary to 19 male ministers. No women serve as provincial governors. The political establishment in Turkmenistan is a lot further when it comes to emancipation of women than most citizens are. However, at the same time the position of women declined due to government policies. This has to do with the nationalist ideology that was promoted after 1991, which also sought to ‘re-traditionalize’ Turkmen society. According to article 18 of the Turkmen constitution men and women have equal rights and Turkmenistan adopted and ratified several international human rights instruments like the Convention on the Elimination of All Forms of Discrimination Against Women (EAFDAW). However, in May 2007 the United Nations Committee on the Elimination of Discrimination against Women raised concerns at Turkmenistan's lack of awareness of the urgent need to stem violence against women, to pass specific legislation, including on domestic violence and to introduce measures to address trafficking in women. The comittee among others urged Turkmenistan to criminalize domestic violence, bring to justice the perpetrators, ensure that the victims have access to appropriate redress and ensure that shelters are set up. The Committee also recommended that the government needs to provide an enabling environment for women's and human rights organizations. Minorities are represented in the government, although preference is given to ethnic Turkmen. The Mejlis predominantly consists of ethnic Turkmen, with no more than a few ethnic Russians and Uzbeks. Turkmen comprise approximately 77 percent of the population of about 5.5 million; Uzbeks 9 percent, Russians 7 percent, and Kazakhs 7 percent. There are smaller numbers of Armenians, Azeri’s and many other ethnic groups. Since its independence, the country has not experienced ethnic turmoil. As part of its nation-building efforts, the government has attempted to foster Turkmen national pride, in part through its language policy. The constitution designates Turkmen as the official language, and it is a mandatory subject in school. Russian remains of common usage in government and commerce. However, the president has criticized the widespread use of Russian. On the one hand, language has become a mechanism for exclusion in recent years. Non-ethnic Turkmen employees at government ministries reportedly were given until December 1999 to learn Turkmen. Non-Turkmen feared that the designation of Turkmen as the official language would place their children at a disadvantage educationally and economically. They complained that some avenues for promotion and job advancement were no longer open to them. Only a handful of non Turkmen occupy high-echelon jobs in the ministries, and there have been reports that managerial positions are closed to non-Turkmen. Those who were able, mostly Russians, left Turkmenistan in large numbers because of these measures. At the same time the focus on the Turkmen language withholds people form retrieving information in other languages. On 15 January 2012, a new law on political parties was signed by Berdimuhamedov. The law defines the legal basis for the establishment of political parties, their rights and obligations, guarantees of their activities, and regulates the relations of political parties with government agencies and other organizations. It is designed to regulate the right of citizens to form political parties and the procedure of establishment, operation, reorganization and liquidation of political parties in the country. However, all these developments proved meaningless, as all candidates in the presidential elections were supporters of Berdimuhamedov. Even those opposition parties listed below at the election section - except perhaps for the first two - are actually stained because their leaders formerly fulfilled high post under the regime. On 15 December 2013, Turkmenistan held its first multi-party parliamentary elections. Until January 2012, when a law permitted the creation of opposition parties, the Democratic Party of Turkmenistan (DPT) was the only registered party of Turkmenistan. In August 2012 the Party of Industrialists and Entrepreneurs (PIE) was established, but the party pledged allegiance to President Gurbanguly Berdimuhamedov and is viewed as a government’s ally rather than a opposition party. On 15 December, 238 contestants ran in the parliamentary elections. Candidates of the DPT and PIE, along with members of state-sponsored trade unions, a women's union and a youth organization, sought seats in the 125-member legislature, which formally approves any decision made by Berdimuhamedov. The day after, the Central Election Commission (CEC) of Turkmenistan said the turnout was 91.3 percent with the DPT winning all the 125 seats. London-based Amnesty International said in a statement, based on reports of Radio Free Europe correspondents in Turkmenistan, that the elections were marked by an “atmosphere of total repression”, while torture is widely used in Turkmen prisons to elicit confessions and secure confessions. “There is still no genuine opposition party, no independent media and not a single independent human rights organization operating freely inside the country”, the statement said. News agency Reuters stated that there was no real competition during the elections as both the ruling DPT and the new PIE were supporting Berdimuhamedov, while opponents remained in exile. To the contrary, the Commonwealth of Independent States (CIS) held an observer mission and said the elections were "free" and adhered to "democratic principles". The elections were the first in the country attended by a delegation from the Parliamentary Assembly of the Organization for Security and Cooperation in Europe (OSCE). The OSCE sent a 15-member team to the country by invitation of the government. It published its recommendations for the government in February 2014. On 12 February 2017 presidential elections were held in Turkmenistan, allowing candidates from non-government parties to run for the first time. Due to constitutional amendments implemented last year, candidates older than 70 year were permitted to take part in the presidential elections. The amendment is widely seen as a reform adopted to ensure that Berdimuhamedov rules for life. Furthermore, the reforms extended the presidential term from five to seven years. Besides the incumbent president there were eight other candidates on the ballot, made up of government officials, lawmakers, and heads of companies. The eight candidates received little attention from the media, which is controlled by the state. The current president, however, was covered a lot, appearing in several towns and cities. 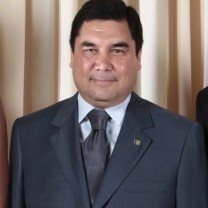 On 13 February 2017 the Election Commission announced that Turkmenistan’s incumbent President Berdimuhamedov had been re-elected. Berdimuhamedov supposedly won 97.69 percent of all votes, even more than the 97.14 percent he gained in the 2012 elections. The turnout-rate of eligible voters was 97.27 percent according to official statements. It is very much doubted that these results are truthful though; Turkmenistan’s elections have not been regarded as free or fair since 1991, when the country became independent. Furthermore, RFE/RL Turkmen Service reported that days before the official election day, a group of students was asked to fill in ballots in favour of Berdimuhamedov. Before the new Political Parties Law of January 2012 was passed by the Turkmen parliament, the country consisted of a one-party system which was dominated by the Democratic Party of Turkmenistan (DPT). This governmental party of former President Niyazov and current President Berdimuhamedov was established after the Communist Party of Turkmenistan was renamed the Democratic Party of Turkmenistan in December 1991. According to its program, the DPT serves as a mother party that dominates political activity. Party propaganda is aimed at explaining the need for preserving stability, civil peace, and interethnic accord. Party publications boast that its primary organizations operate in every enterprise, organization, and institution, and that its membership includes over 165,000 people, whereas critics claim that most citizens hardly are aware of the party's existence. In August 2013 Berdimuhamedov stepped down as head of the Democratic Party. The party’s current leader, Ata Serdarov, was elected into the position in April 2018. Since the implementation of the Law on Political Parties in 2012 it is formally possible to form and register political parties as well as non-governmental organizations. Even though the constitutional amendments included an article giving citizens the right to found political parties and public organizations whose activities do not violate other provisions of the constitution, serious opposition against the DPT is impossible in Turkmenistan. After the Law on Political Parties was passed by Turkmen parliament in January 2012, the Party of Industrialists and Entrepreneurs was established in August 2012 as the country’s first legal opposition party. The law defined the legal foundations for forming political entities, their rights and responsibilities, as well as guarantees for parties' activities. It also allowed independent media outlets to be registered. Before the law was passed, Turkmenistan had only room for one political party, namely the Democratic Party of Turkmenistan (DPT). The party is led by Saparmyrat Ovganov, who in December 2017 replaced Ovezmammed Mammedov. The PIE pledged allegiance to President Berdimuhamedov and is widely seen as a tool of the ruling DPT to prevent criticism over Turkmenistan being a single-party state rather than an actual opposition party. Saparmurat Niyazov was born in 1940 in the Turkmen SSR in an Ahal-Teke family. During the Ashgabat earthquake of 1948, Niyazov's mother and brothers died. His father is alleged to have died during WWII. Niyazov subsequently spent several years in Soviet orphanages in Turkmenistan. The alleged 'clan-detachment' resulting from this socialist state upbringing was one of the reasons why he was favored for high political functions by the Soviet powers. After 1991, however, politics under Niyazov would become dominated by 'his' Ahal-Teke clan. Niyazov rose quickly up the Communist party ladder, becoming first secretary of then Soviet Turkmenistan at the age of 45. He became President after the transition to independence in 1991, adopting the title Turkmenbashi, or "Leader of all Turkmen". He was declared president for life in 1999. During his two decades in power, the authoritarian president created a cult of personality around himself and his family. Even the months and days of the week were named after himself and his family. Statues and portraits of the self-styled Turkmenbashi were erected everywhere. He wrote a book which became the centerpiece of Turkmen nationalist ideology under Niyazov and continues to be the source of inspiration for nationalist state ideology under Berdimuhamedov up until today. After an alleged assassination attempt on 25 November 2002, the Turkmen government arrested thousands of suspected conspirators and members of their families. Critics claimed the government staged the attempt in order to crack down on mounting domestic and foreign political opposition. On 21 December 2006, Turkmen state television announced that President Niyazov had died of a sudden heart attack.